Richard Uhlig is one of these people whose names are linked to a number of different machines. 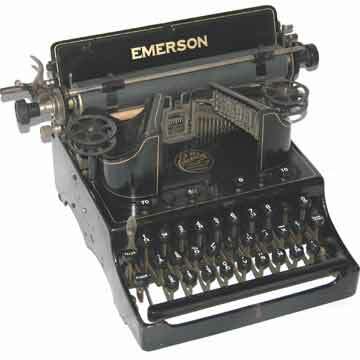 The Emerson, which is said to have been first marketed by 1908 is one of the more impressive examples. Most striking about this machine is the fact that the typebars are placed sideways, and swing against the platen from left and right. The sloping typebar covers give the machine a typical art nouveau appearance. The original design was built as the Secretary typewriter, but immediately taken off the market because of an apparent patent infringement. (See the book TYPEWRITER, page 182, for details.) This explains why the Emerson is labeled â€˜model 3â€™. The Emerson was first manufactured different places. In 1910, the company sold out to Sears Roebuck who moved production to Woodstock. At the same time, a number of changes were made to the original Emerson 3 design. - The black composite keytops (as on the early machine shown here) were replaced with metal-rimmed glass keytops. - The sloping covers over the typebars, originally made of two pieces of sheet metal each, were now made of cast iron. - Later still, the ribbon spools were surrounded with cast iron cups. Sears Roebuck kept up production for about four years, when they switched to the Woodstock typewriter. Total production of Emersons is estimated at about 15,000 machines, not too many of which survive.